Opening arguments before the Supreme Court of the United States (SCOTUS) on Prop 8 and DOMA were about to begin. MCC faith leaders arrived at the crack of dawn on Tuesday, 27 March 2013, dressed in red, inspired by HRC’s red equal sign, to join the prayer and praise from almost every major faith tradition. More than three hundred of the faithful barely slept the night before so they could show up for the 7:30 a.m. sunrise witness for equality. All eyes were on the Rev. Candy Holmes as she led the choir in powerful songs, which awakened every soul. Rev. Holmes was vital to the success of the service in her role as co-planner. Rev. Elder Darlene Garner and many other dignitaries from Metropolitan Community Churches graced the pulpit with their presence and words. Speakers, singers, and dancers — from Buddhist, Native American, Muslim, Christian and other traditions — expressed respect and spiritual depth in both words and action. Take the time to click through the links below for the collections of photos from Kareem Murphy of the MCC Governing Board and Public Policy Team. Click through quickly in each collection and you will feel the action, the motion, and the emotion of the worship service and two days of demonstrations where MCC made its presence known. The PBS News Hour covered the voices of faith present on the steps of the Supreme Court, representing both progressives and voices of exclusion. The Rev. Mike Schuenemeyer, UCC head of the office for LGBT ministries and a key organizer for faith voices, urged SCOTUS to decide for our rights. 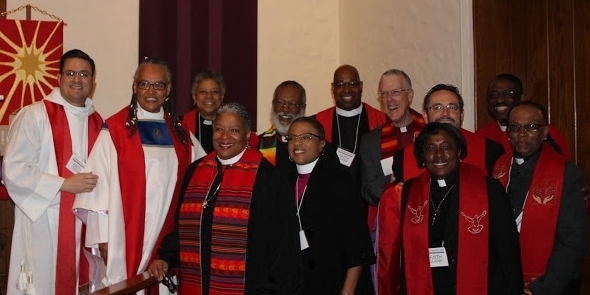 Bishop Yvette Flunder, presiding bishop of The Fellowship of Affirming Ministries (TFAM), inspired the thousands gathered for equality with the historic freedom song, Ain’t Gonna Let Nobody Turn Me Around.